As you may have seen in our Shaggy video, the official mascots of Euro 2008 are scary twins Trix and Flix. 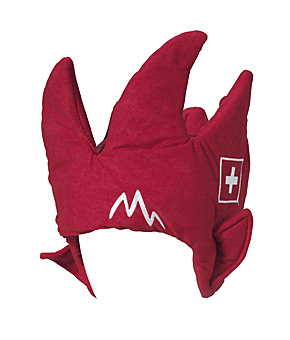 Never ones to miss an opportunity to sell some pointless crap, Uefa’s official merchandise range for the tournament provides the opportunity to buy this Trix and Flix hat. The crazy headgear gives you the opportunity to imitate the mascots’ red, mountain-themed hair without a visit to your hairdresser. Excellent. Click here to buy.